Let me begin by mentioning how thankful and blessed I feel to be broaching this topic here on Gabby’s blog. If you know Gabrielle’s story, then you know how we painfully surrendered the expectation of a normal future for our little girl many times over. I surrendered the expectation that my child would crawl, and walk, and talk. I surrendered the expectation that my child would feed herself, be potty trained, and climb in and out of bed. I remember telling a few dear friends of mine (as I detailed the heartbreak, the miracles, the struggles, and the triumphs on this blog) how it had really become a dream of mine that Gabrielle would one day be able to *read* this blog and understand the amazing ways God had worked in her life. As I shared this hope, I recall my eyes brimming with tears. The tears threatened to spill forth because I knew it would represent another miracle. Another miracle I was frightened to hope or wish for. A milestone that could mean future independence. A milestone that would open so many doors to a bright and fulfilling future. My Gabby, arriving at a place where she could read and understand written English, a miracle for sure. So here I stand at the crossroads, about to embark on this journey, wondering if this will be part of God’s plan for my sweet princess, or not. In trying to prepare and research the best approach, I accessed something that was filed away deep in the recesses of my mind. I recalled reading somewhere, surely on another mom’s blog, how children with brain injury often learn best using a sight word approach in the first five years of development. 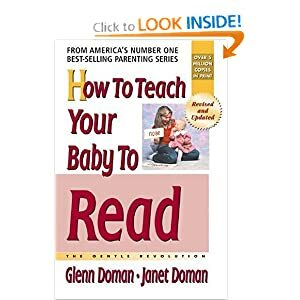 Upon googling, I immediately came across two books by Glen Doman: How To Teach Your Baby To Read and What To Do About Your Brain-Injured Child. I was so anxious to read the books and get started, that I forgot to order kindle editions. Two days later my paperback books arrived, which I shall forever cherish as collector’s items, or more likely pass onto another mom. I began reading How To Teach Your Baby To Read first, and found it to be very informative, logical, and exciting. I taught my four oldest children to read using the phonics approach, and therefore I’m pretty familiar with the tedious struggles that it can introduce. It takes a lot of juggling and perseverance for the typical five year old to master all the different sounds and rules, in order to become a successful reader. This book is inspirational because it argues that a child can grasp the written word, just as easily as the spoken word, if it’s introduced correctly and at the appropriate time (ideally in the first five years). Heck, I thought, I can teach my three youngest to read simultaneously. And I was off…. As far as Glenn Doman’s other book goes, What To Do About Your Brain Injured Child, I’m half-way through and it is wow. Just wow. Now mind you, I studied psychobiology/neuroscience for my college major, so I’ve always found this kind of stuff interesting. But people, this book is completely fascinating. If you have a brain-injured child, it’s a must read. Are you treating the symptom or the problem itself? That’s all I have to say. Wow, Kelly, I can’t wait to hear what happens! According to my mom who has a master’s in reading, whole word reading is what we do in the end anyway. Go for it!! !